SAO PAULO, March 23, 2018 /PRNewswire/ — Hikvision, the world’s leading supplier in innovative video surveillance products and solutions, announced that the company has agreed to a partnership deal with Corinthians, the Sao Paulo-based Campeonato Brasileiro Serie A football club. As part of the three-year deal, Hikvision will provide the 49,000-seat stadium with a security solution combining a number of products, such as the AI-powered facial recognition cameras, and DarkFighter cameras that deliver bright and full-colored images in almost complete darkness, and Automatic Number Plate Recognition cameras, Hikvision PanoVu cameras with 360 degree panoramic view, as well as access control equipment, among others. 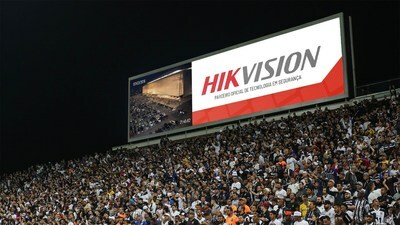 As an official partner in security technology, Hikvision is also responsible for the maintenance and expansion of the Arena Corinthians’ security system. Inaugurated in May 2014, Arena Corinthians was the venue of the Corinthians opening at the 2014 FIFA World Cup and received 5 matches of this international competition. In 2016, it hosted the Olympic Games soccer tournament. Official stadium of Sport Club Corinthians Paulista, where the club has an enviable record, Arena Corinthians is characterised by being a complete entertainment platform, with privileged spaces for sports, social, and corporate events.